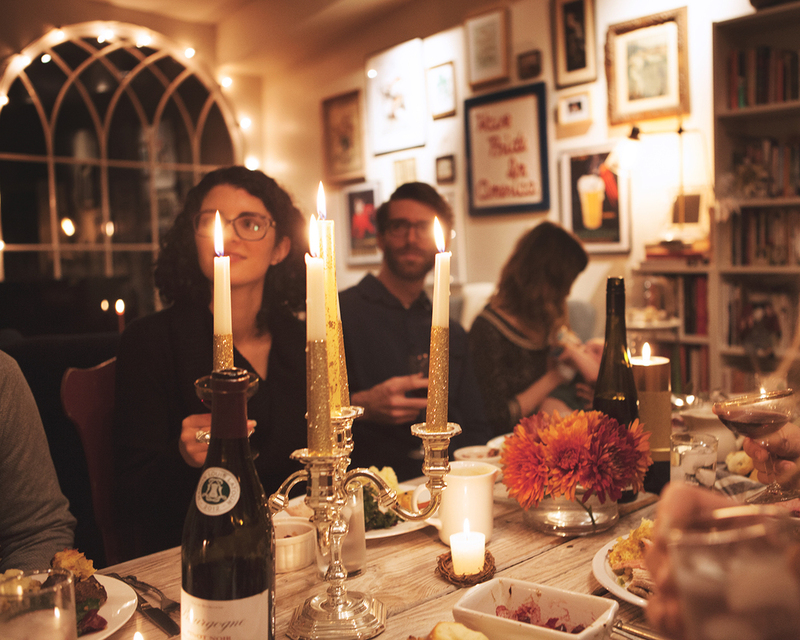 I think we love hosting Friendsgiving so much because it's such a challenge of recipe planning, making it all, getting it photographed, while somehow keeping our friends not waiting TOO long to eat. This year was no different, but Robert's 15 minute increment check list kept up both particularly on schedule. 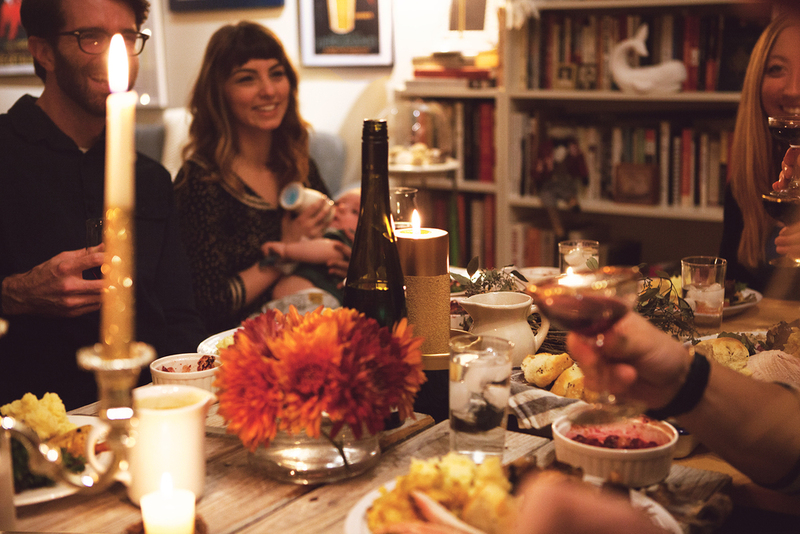 I love getting friends together for such a huge meal, especially when they're traveling far for it. It reminds me of how important it is to make time for those close to us we aren't seeing as frequently as we'd like to. I made my absolute favorite parker house rolls, and was quite loose with the uniformity, which I think I came from juggling getting 4 things baked the same morning. They always come out so pillowy and delicious. Traditional parker house rolls have lots, and lots of butter. Butter while they bake, topped with butter... I like to add a seed mix instead while they bake, a nice finishing touch. The crowd favorite apple pie I like to make got a slight twist this year. I always do big slices of apples, but this time I left the skins on and let them sit overnight with the cinnamon sugar mixture. I was really happy with the outcome, more of a soft baked apple texture that was packed with cinnamon sugar flavor. I was at a loss for my favorite dish of the evening. Robert's cornbread stuffing was to die for and the leftover that I keep picking at the most in the fridge. Maybe my favorite part about Thanksgiving food is the leftovers, no definitely that's my favorite part, because making a free-form pancake out of stuffing and topping it with a fried egg is heavenly. The citrus, fennel and peppercorn dry brine that Robert did to the turkey was maybe the most time consuming, and tasted amazing. If using that recipe you'll need to use a dehydrator to make a citrus powder for the dry brine, if you can get your hands on one or have it already it's worth it. I hope you all have an amazing Thanksgiving! Using a vegetable peeler, remove peels from oranges and lemons. Using a dehydrator, dry peels on the lowest setting for approximately 6 hours, or until brittle and easily cracked. Set aside. In a cast iron skillet over medium-high heat, toast star anise, fennel, and peppercorns until fragrant, about 4 minutes. Set aside to cool. While cooling, using a spice mill or small blender, pulverize orange and lemon peels until a powder or very fine pieces are formed. Add contents of skillet as well as bay leaves, thyme and red pepper and continue pulverizing until combined. In a small bowl, mix together contents of spice mill with salt and sugar, set aside. To prepare turkey, remove from packaging, pat try, and clean cavity. Rub turkey with dry brine and chill, uncovered on a baking sheet for 6-10 hours. Preheat oven to 450°. Remove turkey from refrigerator and rinse brine. Dry turkey, and working carefully separate skin from meat. Rub butter in between meat and skin and stuff with sage leaves. Fill cavity with onion, rosemary and thyme. Tuck wing tips under bird and truss legs together. Roast for 45 minutes. Reduce heat to 350° and continue roasting for up to 2 hours additionally, or until an instant read thermometer reads 160° when inserted into the thickest part of the thigh. Rest 20 minutes then carve to serve. Cut potatoes into rough 2’’ chunks. Place potatoes in a large dutch oven and fill wit cold water until covered. Bring to a boil, reduce to a simmer and cook for 25 minutes, or until potatoes pierce easily with a fork. Drain potatoes and set aside (do not let cool). Meanwhile, in a small saucepan over low heat, warm milk, butter, sage and thyme. Let sit, covered as herbs steep in milk. Using a potato ricer, pass potato chunks back into warm dutch oven. After all potatoes have been riced, discard herbs from milk mixture and working in small additions, stir vigorously into potatoes. Stir to combine and season generously with salt and pepper. Preheat oven to 300°. Tear cornbread into loose chunks and bake on baking sheet until dried and crumbly, about 10 minutes. Transfer to a large bowl and set aside. Increase oven temperature to 400°. Toss butternut squash with olive oil and season with salt and pepper. Transfer to a baking sheet and roast until chunks are tender and browned, about 25 minutes, turning occasionally. Remove from heat and set aside. In a large skillet over medium high heat, cook sausage until browned, about 5 minutes. Remove from skillet and set aside. Using remaining drippings from rendered sausage, cook onions, celery, and carrots until softened, about 5 minutes. Return sausage to skillet and toss to combine. Add mixture to corn bread with the fresh sage. In a small bowl, whisk together turkey stock and egg. Pour mixture over cornbread and toss to combine. Pour into an oiled casserole dish, cover and bake for 30 minutes. Remove foil and bake an additional 25 minutes until top is golden brown. Preheat oven to 425°. Whisk together cornmeal, flour, sugar, baking powder, baking soda and salt. Mix the egg and milks together until well blended and pour over dry ingredients. Stir to incorporate. Over medium heat, melt the butter in a 10" cast iron skillet, stirring to coat all sides. Remove from heat and pour in batter. Drizzle honey over top and bake for 25 minutes, or until the edges are browned and the center is cooked through. Whisk yeast with warm water and let stand for 5 minutes. Heat the whole milk in a small sauce pan until just warm. In a large mixing bowl stir together the butter, sugar and kosher salt. Add the warm milk and whisk until incorporated. Add egg and yeast mixture and continue stirring. Pour in flour and continue to stir until dough forms. Turn the dough out onto a lightly floured surface and knead until smooth. Transfer to a lightly oiled bowl, turning to coat. Cover loosely and let stand until doubled in size, about 1 1/2 hours. Melt butter and preheat oven to 350°. Prepare a 13x9 inch baking pan with a light coating of butter and set aside. Punch down dough and divide into 4 equal pieces. Working one piece at a time, roll out into a 12x6 inch rectangle. Cut the dough lengthwise into three 2-inch wide strips, and cut each crosswise into three 4x2 inch rectangles. Brush half of each piece of dough with melted butter, fold over and place flat in the baking dish. Add remaining dough to create 4 rows until all rolls are in the pan. Brush the tops with melted butter and sprinkle with seed mixture. Loosely cover with plastic wrap and chill for 30 minutes. Bake until golden brown, 25-30 minutes. Serve warm. Preheat oven to 300°. combine breads and bake on baking sheet until dried and crumbly, about 10 minutes. Transfer to a large bowl and set aside. In a large skillet over medium high heat, warm butter until melted. Add leeks, onion, celery and carrot to skillet, season with salt and pepper and cook until softened, about 10 minutes. Add hazelnuts to skillet and toss to combine. Remove from heat and add mixture to bread. In a small bowl, whisk together turkey stock and egg. Pour mixture over bread and vegetables and toss to combine. Pour into an oiled casserole dish, cover and bake for 30 minutes. Remove foil and bake an additional 25 minutes until top is golden brown. Preheat oven to 325°. In a large bowl, toss carrots and parsnips with olive oil and season generously with salt and pepper. Roast on a baking sheet for up to 1 hour or until vegetables are very tender, turning occasionally. Once cooked through, remove from heat and set aside to cool. In a small non-reactive bowl, combine vinegar, garlic powder, and salt and pepper. In a skillet over medium high heat, melt butter. Continue cooking butter until solids separate and begin to brown. Cook butter until lightly browned and nutty, about 2 minutes. When butter is browned, slowly whisk into vinegar mixture, until a dressing is formed. 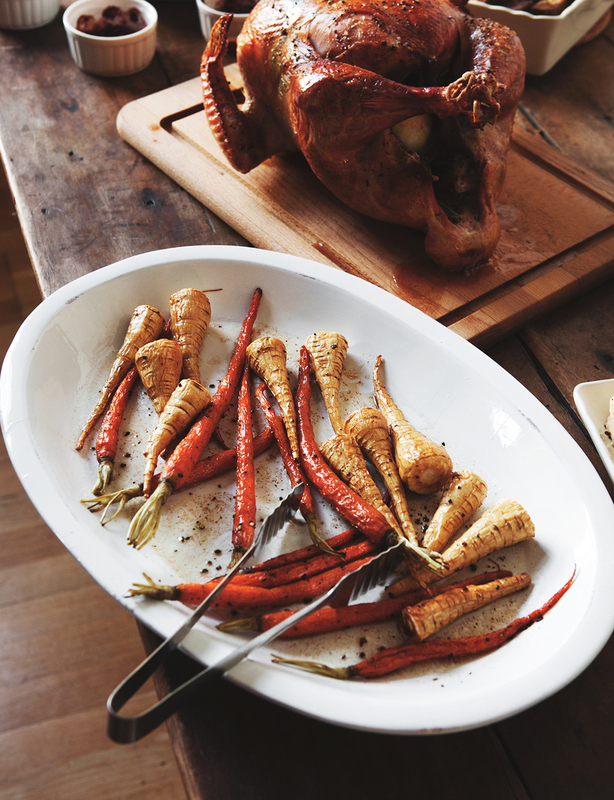 Dress carrots and parsnips immediately and serve. Combine barley with water, covering by 1 inch and bring to a boil in a medium pot. Reduce to a simmer and cook, covered, for 30 minutes. Remove from heat and drain, set aside. In a large skillet over medium-high heat, melt 1 tbs butter until shimmering and add mushrooms. Cook, undisturbed until golden brown, about 3 minutes. Season mushrooms with salt and pepper and toss, cooking an additional 3 minutes. Add 1 tbs butter to skillet and toss to coat. Add cooked barley, thyme and remaining butter to skillet and toss to combine. Continue cooking until barley is warmed and butter is melted, about 3 additional minutes. Add parmesan cheese, season with salt and pepper and continue tossing in skillet to incorporate cheese into mixture. Serve with additional parmesan cheese shavings on top and parsley. Add bacon to a cold skillet and set over medium-low heat. Slowly render bacon until crispy, about 15 minutes. Remove from heat and set aside on a paper towel lined plate. In a small non-reactive bowl, whisk together vinegar, mustard, salt and pepper. Slowly whisk in oil until emulsified and set aside. To assemble salad, combine kale, radicchio, pears, walnuts and bacon in a large bowl. Toss with dressing and serve. Preheat the oven to 425°. Place the apple slices in a large bowl and pour boiling cider over top. Cover the bowl and let sit for 10 minutes. Drain the apples until completely dry. Add sugars, cinnamon, corn starch and salt to the apples and mix until completely coated. Cover the apples with plastic wrap and refrigerate overnight until ready to use. Roll out the bottom pie crust about 12" in diameter, 1/8th-inch and place in 9" pie plate and set aside. Meanwhile, roll out the top pie crust to the same dimensions and cut into about 12, 1" strips. A straight edge or ruler is helpful to ensure similar pieces, but don't worry about them being perfectly uniform. The strips will overhang the edge depending on where they land across the pie plate. Once the strips are cut, lay half across the pie vertically. Turn the pie plate so the strips are horizontal, and turn every other strip halfway back, this way you'll be able to weave the other pie strips going the opposite direction. Place a dough strip vertically in the center of the pie, and fold the pieces back over. Next, fold back the other vertical strips that were not previously woven through, placing another horizontal strip on top, finishing by folding the vertical strips back over. Repeat this weave with remaining pie strips, until the top of the pie is covered with the woven pie strips. Trim the excess pie dough from the sides and score the edges with a fork. Bake for 20 minutes at 425°. After 20 minutes, reduce the heat to 375° and continue baking for 25 minutes, until the apples are bubbling and the crust is deep golden brown. Cool for 2 hours before serving. Using a stand mixer with the paddle attachment add flour, sugar, salt and butter to the bowl. Coat the butter with the flour, and begin mixing on low-medium speed until a coarse meal forms. Slowly add cold water to the mixture until a dough begins to gather, adding the extra water if the dough seems too dry. If you've found your dough is on the wet side, add flour, an additional tablespoon at a time until dough is easy to handle. Divide the dough in half and form each into a disk. Wrap in plastic and refrigerate for 2 hours before baking.